The Code of Professional Conduct provides guidance for working interpreters in decision making throughout the course of their work. Nonetheless, interpreters encounter many situations which can only be referred to as "sticky". Interpreters seeking assistance when facing those situations find that many qualified and experienced interpreters will arrive at varying conclusions using the very same Code of Professional Conduct to justify their reasonings. The infamous phrase, “it depends,” seems to reign supreme. How then can interpreters know that they have arrived at the correct decision? How then can one navigate through their decisions and choose correctly how to respond? Social media has provided a wonderful platform for us to learn from each other and a place in which one can feel completely crushed because of divergent responses. This webinar will set the foundation for subsequent webinars and distance learning case studies. This webinar will be presented in ASL only. Key concepts will be included in the presenation which will be available for download prior to viewing the webinar. Request for reasonable accomodations must be sent to pd@crabtreeinterpreting.com prior to the purchase of the webinar. Apply these concepts in a case study analysis of a proposed ethical situation. Justin Lee currently holds the BEI Master Certification and the RID/NAD National Interpreter Certification. He has been professionally interpreting since 2004 and involved in the Deaf community since elementary school. He works for Crabtree Interpreting Services, located in Houston, as a Professional Development Project Manager. He has a passion for sociolinguistics and learning, and he loves to instill the same passion in the interpreters he mentors. Our webinars are self-paced and may be completed at your leisure. You will have 30 days after we receive your payment and registration to complete the required coursework. As such, we will not be offering refunds. TSID is an Approved RID CMP Sponsor for Continuing Education Activities. This Professional Studies program is offered for 0.20 CEUs at the “Some Content Knowledge Level. This webinar is designed for working certified interpreters. Crabtree Interpreting Services fosters an environment of mutual respect and inclusion that is free from harassment, bias and discrimination based on race, color, religion (creed), hearing status, gender, gender expression, age, national origin (ancestry), disability, marital status, sexual orientation, or military status. Complete the form below to register for the webinar, then pay through the PayPal. Once we receive your payment, we will send you the login information to access the webinar. 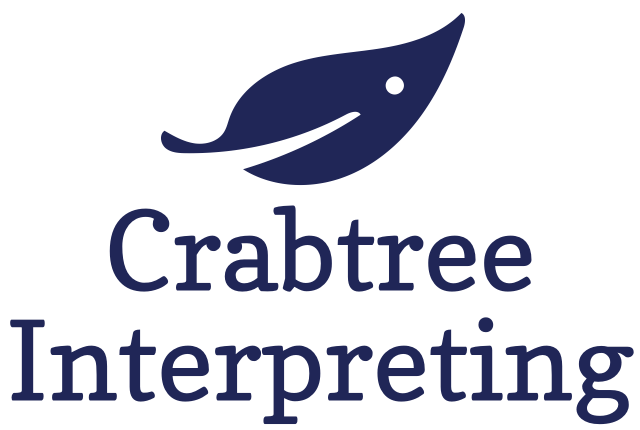 Crabtree Interpreting Services is a Houston, Texas based American Sign Language Interpreting agency with expertise in educational, community, and social service sign language interpretation.